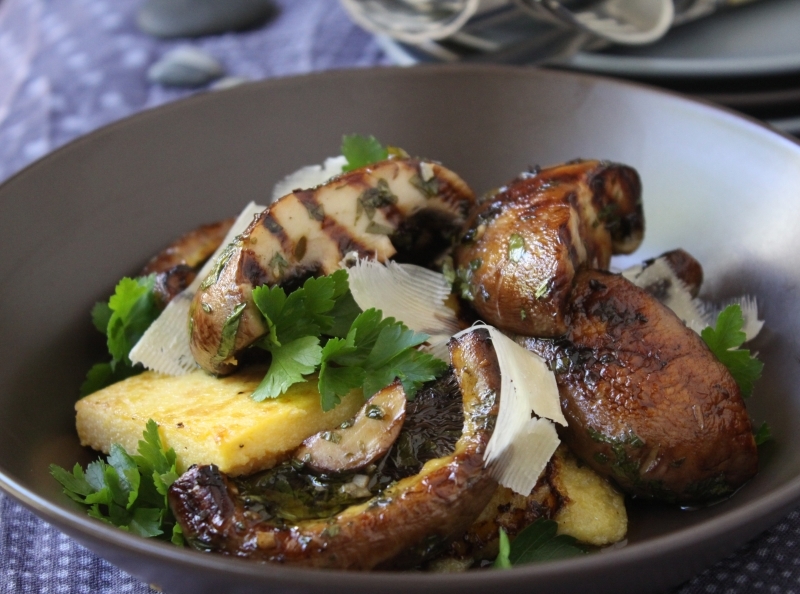 Earthy, richly satisfying, and deeply warming on a windy winter’s day, these marinated and grilled portabello mushrooms with polenta are simply delicious. I love the almost meaty flavour of the portabello mushroom, and because they are robust in texture, they respond well to grilling. The marinade is greedily soaked up, and prevents the mushrooms becoming dry and wizened. 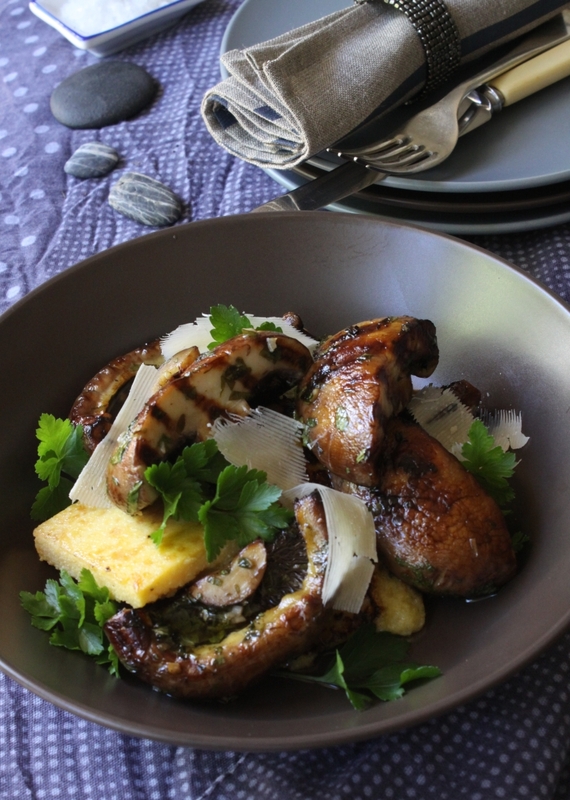 I grilled the polenta, but the mushrooms would be equally gorgeous with a generous serving of soft polenta as the base. Wipe the mushrooms gently to remove any earth and then slice in half. In a glass bowl place the vinegar, olive oil, garlic, thyme, parsley, a good grind of black pepper and a pinch of sea salt. Mix together and then gently toss through the mushrooms until they are well coated. set aside for about an hour. Meanwhile, bring the stock to the boil in a medium saucepan. Sprinkle in the polenta, and then whisk continually as it thickens. When it is done it should be like very thick porridge, but with no lumps, and should take about 5 – 6 minutes. Whisk in the butter until fully melted and incorporated and then pour into a 25 cm x 30 cm shallow baking tray that you have oiled with the extra olive oil. Set aside until cool and set, which should take about 1 hour. Heat a grill pan, or the bar-be-que grill and over a medium heat, grill the mushrooms until they are golden brown and well cooked, turning to make sure all sides are cooked. Take the mushrooms off the grill and keep warm. Turn out the polenta onto a sheet of silicon paper. This should not be a moment for breath holding, as it doesn’t stick to the pan. Carefully slice into pieces about 5 cm x 3 cm and then grill for about 5 minutes each side. It shouldn’t stick if you have the consistency correct. I did make it once where the polenta was a bit soft and, well, suffice it to say, the grill was a sea of collapsed and burning polenta, and the result not pretty, although delicious! Serve the polenta with the mushrooms on top, and the extra parsley and parmesan scattered over for garnish.